The Diamondbacks have officially extended Paul Goldschimidt's contract. Goldschmidt is now under contract with the Diamondbacks through 2018. You can read all about the deal over at MLBTR. We now have most of our core players locked up for at least the next three years. Hopefully this will be a good formula for success. 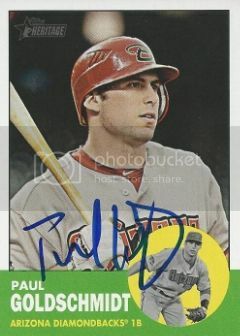 Paul signed his 2012 Topps Heritage card for us after a Spring Training practice in February. 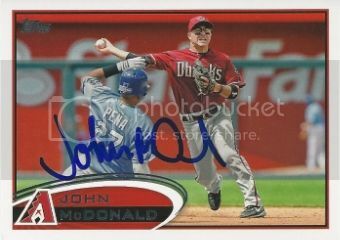 Last week John McDonald was traded from the Diamondbacks to the Pirates. Not too long before that the Prime Minister of Defense signed his 2012 Topps card for us. 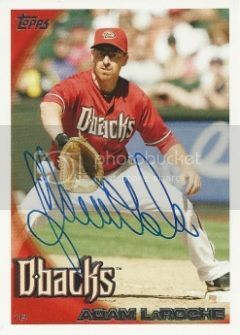 John played in 89 games for the D-Backs over the last season and a half. He seemed like a really nice guy. I've seen quite a few tweets and blog comments recently about how much he'll be missed in Arizona. Zach from Autographed Cards was in town this week. We met up yesterday over in Surprise to catch the Diamondbacks and Royals game. We were able to get a few autographs pregame. 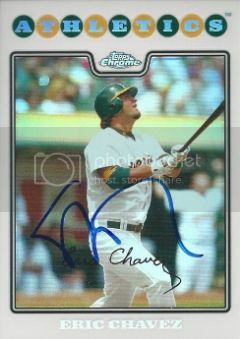 Nothing too earth shattering but I did go home with this 2008 Topps Chrome Refractor signed by Eric Chavez. Zach from Autographed Cards was in town this week. We met up today over in Surprise to catch the Diamondbacks and Royals game. His favorite team versus my favorite team. It was perfect. Zach showed up bearing gifts. 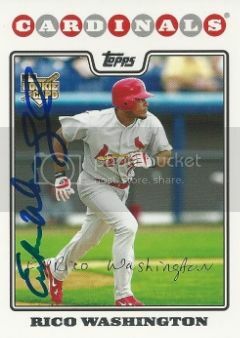 He gave me this 2008 Topps signed Rico Washington card for our set. I remember when Rico was a pretty big deal with the Pirates. He didn't pan out and it took him 10 years to reach the big leagues. He had his first and only cup of coffee with the Cardinals in 2008. One thing I really like about this year's Opening Day set is the inserts. They brought back a few of the favorites from last year and added some more. The mascot cards are back. 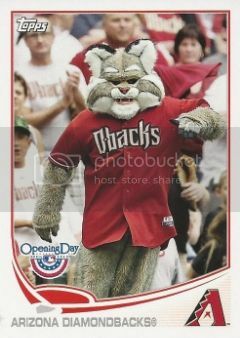 In one of my two packs, I got the Diamondbacks mascot, Baxter! During every trip we made to Chase Field last year, my son always wanted to visit Baxter. He meets fans and signs autographs during the fourth inning of each game. I haven't showed the little dude this one yet but I know he'll like it. I'm going to try to slip it into one of the packs I bought for him for Easter. If you happen to pull any mascot cards you don't like, feel free to send them our way. 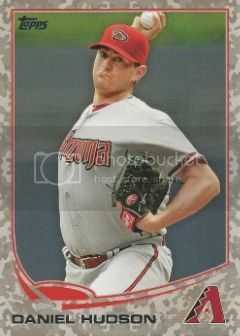 Another day, another new Daniel Hudson card. I stopped by Wal-Mart last night and picked up two packs of 2013 Topps Opening Day. To my surprise, I got the one card I wanted! Not too much to say about this one. It looks like all of the other 2013 Topps cards we've seen except it has the standard Opening Day logo. 2013 Topps Heritage came out a few weeks back. I bought a few packs but didn't get anything worth mentioning. The last few Heritage sets have been done well but I'm not really liking this new installment. There are way to many ugly head shots for me. 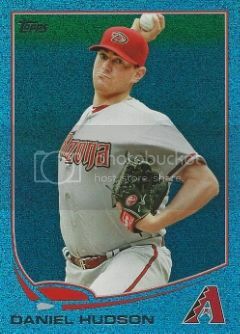 This Daniel Hudson card is a good example. Was this really the best picture they could find? I could also do without the aging effect they apply to the photos. I understand this is set is supposed to have a vintage feel to it but I don't like blurry photos. 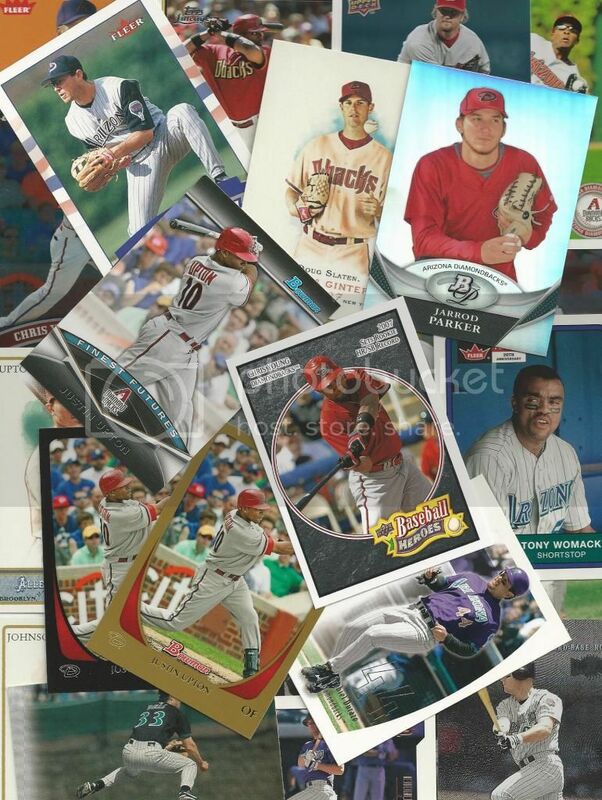 I'll probably try to finish up the Diamondbacks team set but I'm not planning on buying too much else from this set. Definitely no more packs. What are we calling these things? There is nothing silver about them. That was reserved for the redemption cards numbered to 10. I'm going with Silver Slate Redemption Parallel unless someone else has a more official name. This card is so awesome in person that Daniel Hudson himself would be proud. It's similar to the emerald parallels but done better. I guess someone did the math and there has to be less than 150 copies of each of these out there. Fairly limited but not crazy. There have already been three DHuddys on eBay. While I'm enjoying this card, I'm getting ready to do battle to grab a silver border parallel. Get ready world! My credit card has a high limit. I've finally gotten my hands on a Daniel Hudson 2013 Topps Pink Border Parallel! I've won this card twice on eBay. The first one became mysteriously unavailable after the auction closed. This second one got shipped to the wrong address but finally arrived safely today. I thought this was the last card I needed for my rainbow but then Topps started shipping the Silver Slate Redemptions with two new parallels. If that wasn't enough, Opening Day was released this week too. Another two cards. I'll hold off on my rainbow post for a little while. For now enjoy this card that any 4 year old girl would love. I only sent off a few TTM requests this Spring Training. Several of them have come back already. 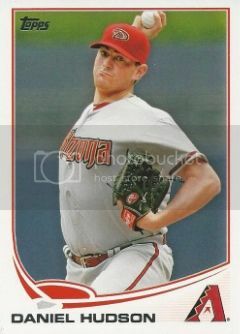 Jake Elmore was a 34th round draft pick for the Diamondbacks in 2008. Prior to that he went to Arizona State. Go Devils! 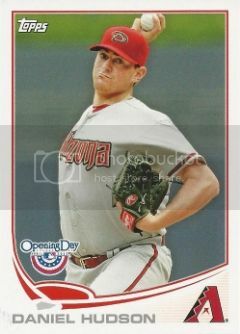 Jake made his MLB debut on Saturday, August 11, 2012. It was also Gerardo Parra bobblehead night. I was at that game. 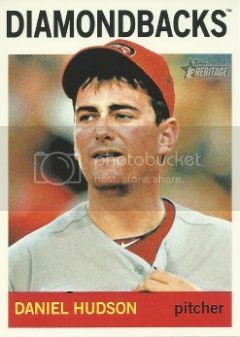 Shortly afterward I purchased a few of his rookie cards with hope that I could get them signed during Spring Training. The D-Backs had other plans as they put him on waivers last November. The Astros swooped in and picked him up. Jake quickly responded to my fan mail request and this awesome autographed card is now part of our Diamondbacks Collection. Xavier Nady is over in Surprise, AZ trying to make the Royals this year. I headed over there one day recently to try to get some autographs and did absolutely horrible. The entire big league team practiced on the two fields where fans really don't have access to them. 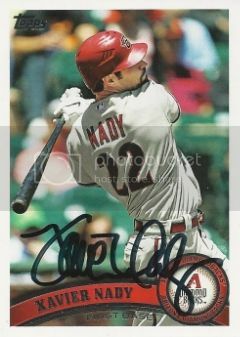 Slightly disappointed, I went home and mailed this 2011 Topps Updates & Highlights card off to Nady. It came back signed over the weekend. Xavier spent one year with the Diamondbacks. He only played in 82 games mostly sharing time at first base with Juan Miranda and Paul Goldschmidt. 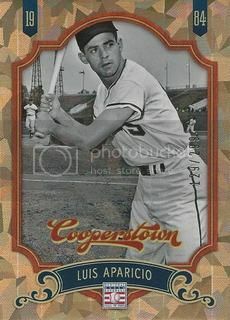 This 2012 Panini Cooperstown Luis Aparicio crystal parallel came in the mail yesterday. I had no idea that the Cooperstown set even had parallels until Brian from 30-Year Old Cardboard posted the Andre Dawson he picked up. After commenting how cool his card was, I hit eBay. There was one Luis Aparicio listed. I grabbed it for $3 shipped. Not bad for a nice card numbered to 299. 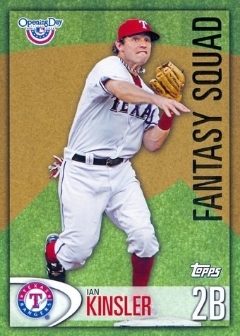 Topps brought back their popular Turkey Red set this year as an online exclusive. There are four Diamondbacks on the checklist. 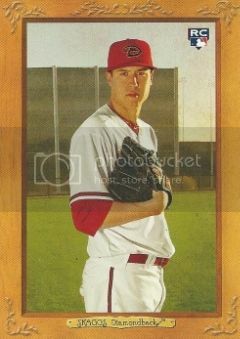 I got this Tyler Skaggs for a buck shipped off eBay. It's a nice card but I'm glad I didn't throw down crazy money for a box. If you'd like to see the entire checklist, Wrigley Wax separated it by team for everyone the other day. Check out his post here. 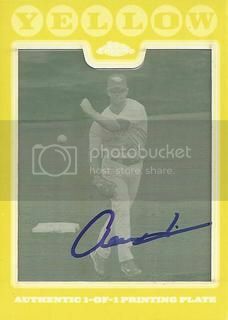 Win a Cal Ripken Jr Autograph! Once a Cub is setting up a pretty cool fantasy baseball league. I've posted about this a few times but now he has sweetened the pot even more to try to fill the last few spots. You'll have a chance at winning a Cal Ripken Jr autograph just for signing up! It's only $15 to play. There will be tons of cool retail blasters you can win at the end of the season plus a few other awesome prizes. I've signed up already, why haven't you? I've created this post in an effort to keep better track of my Diamondbacks autograph collection. The other day I stumbled on the D-Backs all-time roster on MLB.com. I exported the list into Excel and tried to figure out how many players I had autographs from. While doing so, I had an idea. Why not turn it into an ongoing blog post? The purpose of this is to see how many former and current D-Backs players we have autographs from on a baseball card featuring them in a D-Backs baseball card. Kind of like Ryan's Great Orioles Autograph Project but on a much smaller scale. I've outlined a few rules to go along with our new project. In order to make it onto this list, I have to have posted the card on the blog already. Expect a steady flow of D-Backs posts while I try to get caught up. If it's not a D-Backs card, it's not part of this collection. There's a ton of guys who played in Arizona who didn't get a card featuring them on the Diamondbacks. That's a shame but that means they won't be included in this project. Non-2008 Topps cards take precedence over 2008 Topps cards for this project. Actually I haven't added any 08 Topps stuff to this list yet. Cards signed in person take precedence over certified autos. I'll make updates as we post new cards. Enjoy! 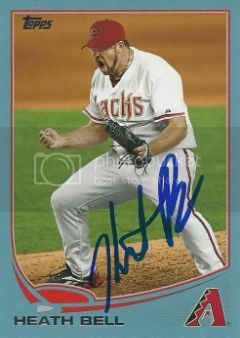 One of the newest members of the Arizona Diamondbacks, Heath Bell signed a card for us at a Spring Training practice. Heath is currently in Miami with Team USA for the World Baseball Classic. They're playing Puerto Rico this afternoon in a loser goes home elimination game. After a rough year with the Marlins in 2012, I'm sure Heath is happy to be back in the familiar NL West. Hopefully he can return to the All-Star form he showed from 2009-2011. I only sent off a few TTM requests this Spring Training. A few of them have come back already. Adam LaRoche signed his card from the 2010 Topps Update set for us. 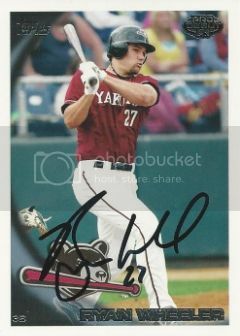 Adam played in 151 games for the D-Backs in 2010. He hit 25 home runs and drove in 100 runs. Pretty much your typical Adam LaRoche season. 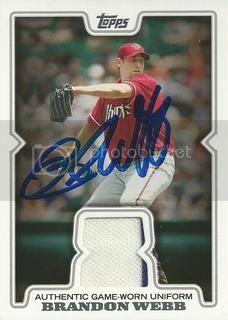 Former Diamondbacks prospect, Ryan Wheeler signed his 2010 Topps Pro Debut set card for us. Ryan was traded to the Rockies this past off-season. After making his MLB debut on July 20th, he had a little over 100 ABs in 50 games for the D-Backs last season. The same seller I bought the 2012 Topps Daniel Hudson base card from had a few other things I liked. 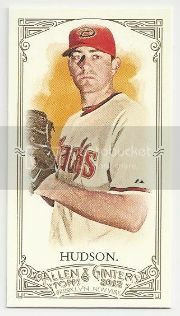 I did't have any of Daniel's mini cards from the 2012 Allen & Ginter set yet. This one is the regular back version. The same seller I bought the 2013 Topps Daniel Hudson base card from had a few other things I liked. 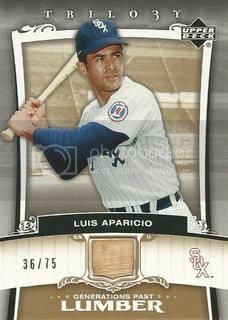 My favorite is this Luis Aparicio mini card from the 2012 Panini Golden Age set. If you're a regular reader of my blog, you've probably seen all of the variations of Daniel Hudson's 2013 Topps card that we've collected so far. Well, we've finally picked up the base version. I found a guy on SportLots who had cheap shipping and a few cards I wanted. This was the first one in my shopping cart. 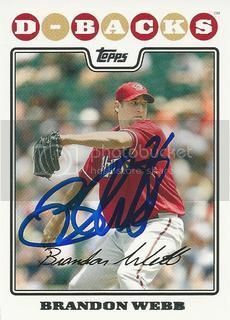 Former Diamondbacks ace, Brandon Webb was signing autographs at a local store on Wednesday afternoon. I figured I'd check it out and ended up being pretty great. Brandon was super friendly. He signed a few cards for me and even a photo they provided. 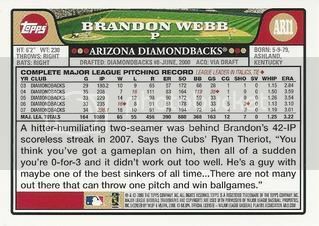 Last November we picked up a Brandon Webb retail relic card from the 2008 Topps set. Brandon signed it for us. I didn't realize until just now that this is the first 2008 Topps relic card we've gotten signed for our collection. I think it turned out well. Daniel from It's Like Having My Own Card Shop was there too. Check out what he got signed here. 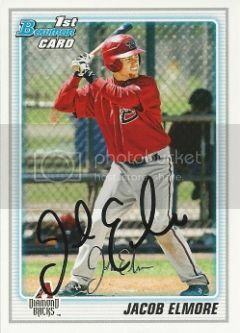 The first card Brandon signed for us was his card from the 2008 Topps Diamondbacks 14 card team set. On a side note, I'm watching the USA versus Mexico World Baseball Classic game right now. I'm trying to get into it this time around. I'll even be going to tomorrow's USA versus Italy game. Alright now we're getting to the good stuff. I've already showed you the blue, red, gold, cyan printing plate, purple, emerald, and black Daniel Hudson 2013 Topps parallels that we've collected. Now we have the camouflage parallel that's numbered to 99 on the back. Alright now we're getting to the good stuff. I've already showed you the blue, red, gold, cyan printing plate, purple, and emerald Daniel Hudson 2013 Topps parallels that we've collected. Now we have the black border that's numbered to 62 on the back. I guess these emerald parallels are growing on me. Now I have the Daniel Hudson emerald parallel so I'm happy. I probably won't be going after any others. A lot of blue and red retail parallels always seem to turn up but the purples are a bit more rare. I don't even know how Toys R Us managed to get themselves their own exclusive but I'm glad they did. 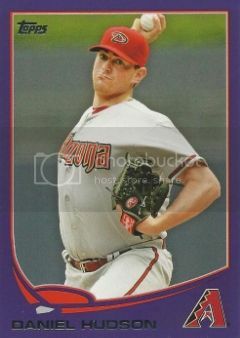 I grabbed the first Daniel Hudson 2013 Topps purple border parallel I could find. Nice card. 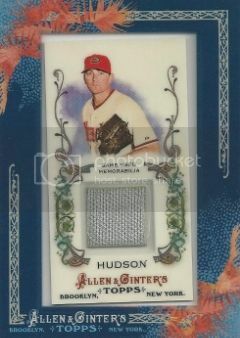 The best Diamondbacks card that Dan from It's Like Having My Own Card Shop gave me is this awesome Daniel Hudson jersey card from the 2011 Allen & Ginter set. I'm not sure how this one slipped passed my radar but Dan had me covered. Thanks, Dan! This one's great. When I met up with Dan from It's Like Having My Own Card Shop at that D-Backs autograph signing about a month ago, he came bearing gifts. Dan hooked me up with a nice pile of random Diamondbacks cards, all of which I had never had before. Thanks, Dan. Below are some of my favorites. Dennis from Too Many Verlanders and Too Many Manninghams sent me a pretty awesome trade package a few weeks ago. 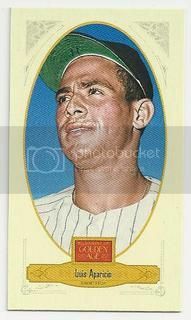 Along with a healthy stack of Diamondbacks, he included this Luis Aparicio bat card from the 2005 Upper Deck Trilogy set. I've seen these before but have never owned one. I think this is the gold version and it's numbered 36/75. At first glance you probably noticed that the bat piece is smaller than on most relic cards. Definitely true but I think it works perfectly with this design. 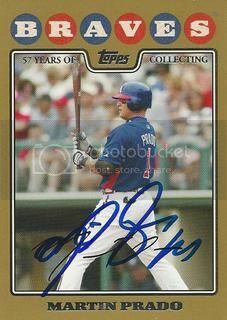 Way before Martin Prado was traded to the Diamondbacks, we had already acquired his signed 2008 Topps card. Remember this post from 2010? Right before Spring Training I picked up his gold border parallel from the 08 Topps set. He signed it for us at a practice just the other day. I listened to an interesting interview on MLB Network Radio the other day where Chipper Jones talked about how much the Braves were going to miss Prado. Hopefully he'll be a key piece to some good D-Backs teams for the next few years. Last July we picked up an Aaron Hill printing plate from the 2008 Topps Chrome set. The other day we had him autograph it. I think it turned out pretty well. Aaron recently signed an extension with the D-Backs so it looks like he'll be a part of our infield for the next few years. 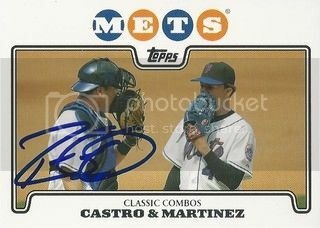 One of the nice things about the 2008 Topps Team Gift Sets are they have some cool classic combos cards. This one features Ramon Castro and Pedro Martinez. Ramon signed it for us at the Dodgers Spring Training practice we went to in February. 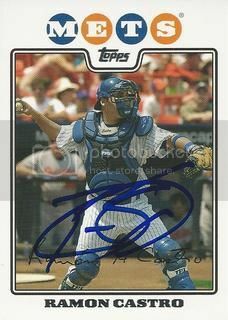 Former Mets catcher, Ramon Castro, had a card in the 2008 Topps New York Mets 55 card team gift set. Ramon said he had never seen this one before. Always cool. Especially since this set came out 4+ years ago.